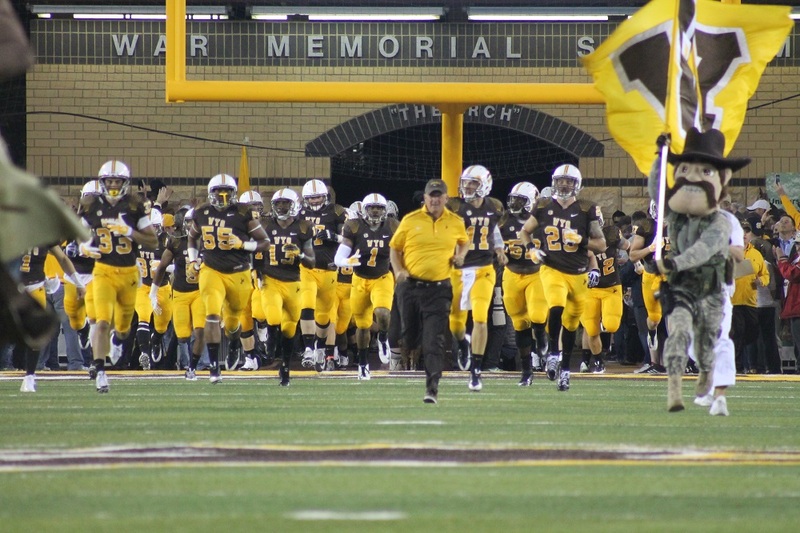 The University of Wyoming had four football student-athletes receive All-Mountain West Conference honors on Tuesday. All four Cowboys were named to the All-Mountain West Second Team. Senior defensive end Eddie Yarbrough, junior offensive guard Chase Roullier, sophomore running back Brian Hill and freshman free safety Andrew Wingard were all named to the Second Team in voting by conference head coaches and media members. For Yarbrough, who played despite a sprained knee his senior season, it was the third consecutive season that he earned All-Conference recognition. He was named First Team All-Mountain West as a sophomore and junior. Roullier earned the second All-Conference honor of his career. In addition to being named Second Team this year, he was an Honorable Mention selection in 2014 as a sophomore. Hill, who led the Mountain West Conference in rushing in 2015, earned his first All-Conference accolade. The sophomore set a new University of Wyoming single-season rushing record this season, with 1,631 yards. Wingard, who started at free safety as a true freshman this season, led the Cowboys in total tackles, with 122, and he ranked No. 2 in the Mountain West Conference in total tackles. In the history of the Mountain West, Yarbrough becomes only the third Cowboy to earn First or Second Team honors in three consecutive seasons. He joins former Cowboy offensive tackle Adam Goldberg in earning two First Team selections and one Second Team selection. Goldberg was Second Team All-MW in 2000 and First Team in 2001 and 2002. Fletcher was Second Team twice (2007, 2008) and First Team once (2009). Wingard joins a select group of Cowboys to earn All-Mountain West Conference recognition as a freshman. Hoost Marsh was the only Cowboy to earn First Team All-MW honors as a freshman. He was selected the Mountain West First Team kick returner in 2004. Wingard is the first Cowboy freshman to earn Second Team All-MW recognition. The other six Wyoming Cowboys to earn All-MW honors as freshmen were Honorable Mention selections. They include: Ryan McGuffey, WR (2000); Guy Tuell, DB (2001); Jovon Bouknight, WR/RS (2002); Ward Dobbs, LB (2005); Blair Burns, CB (2011); and Tim Gleeson, P (2012). Here are highlights of the four Wyoming Cowboys who earned All-Mountain West honors this season, listed alphabetically. Brian Hill, So., RB, Belleville, Ill.
•Selected as one of 11 semifinalists for the 2015 Doak Walker Award. •The only Group of Five running back to be named one of the 11 semifinalists for this year’s Doak Walker Award. •Ranked No. 1 in the Mountain West and No. 7 in the nation in total rushing yards (1,631). •Ranked No. 1 in the MW and No. 8 in the nation in average rushing yards per game (135.9 yards per game). •Ranks No. 4 in the MW and No. 13 in the NCAA in all-purpose yards (146.9 yards per game). •Ranks No. 9 in the MW in total offense (127.2 yards per game). •His 1,631 rushing yards in 2015 set a new Wyoming single-season rushing record. •He became the only Cowboy in history to rush for over 1,500 and over 1,600 yards in a single season. •His 1,631 rushing yards ranks as the sixth best single-season total in Mountain West history, and ranks as the fourth best by a sophomore in MW history. •Hill recorded seven 100-yard rushing games in 2015. •He recorded four 200-yard rushing games in 2015 — one game more than any other running back in the nation. •Hill’s 100-yard games include: 128 at Air Force, 139 at Washington State and 188 vs. Nevada. •His 200-yard games include: 201 at Utah State, 208 at Appalachian State, 232 vs. UNLV and 242 vs. Eastern Michigan. •He reached 1,000 yards rushing faster than any player in Wyoming school history, surpassing 1,000 yards in the 8th game of the season. Chase Roullier, Jr., OG, Savage, Minn.
•Wyoming’s top rated offensive lineman, starting every game in 2015 at left guard for the Cowboys. •Wyoming coaches graded him out at a positive rate of 93.8 percent of all the plays he was involved in in 2015. •Was credited with 76 knockdown blocks on the season. •Allowed only 1.0 sack this season. •Allowed only two other hits on Wyoming QBs in 2015 in addition to the 1.0 sack allowed. •Roullier had only two missed assignments in 740 plays in 2015. •He had only one penalty called on him in the 740 plays he participated in for the 2015 season. •A key blocker in helping Wyoming running back Brian Hill rank No. 7 in the nation in total rushing yards (1,631). •Perhaps Roullier’s best single-game performance came vs. Nevada, when he was credited with 12 knockdown blocks in 71 plays, while not allowing a sack, a QB hurry or a hit on Wyoming’s QBs during the game. and rated by PFF as the No. 1 overall graded offensive guard in the nation and the No. 9 overall offensive or defensive lineman based on film graded by PFF. •Voted a team captain in 2015 as a junior. Andrew Wingard, Fr., FS, Arvada, Colo.
•Ranked No. 1 in the Mountain West and No. 5 in the NCAA among all players at all positions in solo tackles in 2015 (6.9 solo tackles per game). •Ranked No. 2 in the Mountain West and No. 12 in the nation among all players at all positions in total tackles in 2015 (10.2 tackles per game). •Ranked No. 1 in the MW among all defensive backs in tackles (10.2 tackles per game). •Led Wyoming in total tackles this season with 122. •Became the first freshman in school history to exceed 100 tackles in a single season (122). •His 122 total tackles rank as the 15th best single season in school history. •Wingard recorded seven double-figure tackles games in the first 12 games of his career. •He had a single-game best 16 tackles at San Diego State, 15 tackles at Utah State, 12 vs. Washington State and Eastern Michigan, 11 vs. Boise State and Colorado State and 10 at Air Force. •Made his first career interception vs. Colorado State. •Also was credited with 7.0 tackles for loss in 2015. •Accomplished all of this as a true freshman. Eddie Yarbrough, Sr., DE, Aurora, Colo.
• Ranked No. 1 among all Mountain West defensive linemen in tackles in 2015, averaging 5.2 per game. •Ranked No. 5 in the Mountain West in sacks, with 7.0 sacks (0.58 sacks per game). •Named to 2015 Rotary Lombardi Award Watch List. •Named to 2015 Ted Hendricks Award Watch List. •Selected to the 2015 Preseason All-Mountain West Conference team. •Set a new University of Wyoming record for career tackles for loss (39.0). •Ranks No. 9 in school history in career sacks (21.5). •Voted a team captain as both a junior and senior. •Led Wyoming in sacks (7.0) and tackles for loss (10.5) in 2015. •Had 62 total tackles in 2015. •Had a season high 10 tackles at Utah State, including 1.0 tackle for loss and one blocked kick. •Credited with 8 tackles vs. Colorado State, including 1.5 tackles for loss and 1.0 sack. •Registered 7 tackles, 2.0 sacks, 2.0 tackles for loss and one forced fumble in career finale vs. UNLV. •Recorded 6 tackles, including 2.0 sacks at Washington State. •Had 5 tackles each versus Boise State, Nevada and Appalachian State. •Was credited with 4 tackles each versus New Mexico and Air Force.